It was a fast month to say the least. Rich and I spent the better part of three weeks setting up the show, working the booth and taking it down, and shipping it home. Everything arrived on Monday safe and sound, Alex did an unbelievable job getting everything on the truck safe and secure. For his first full teardown and ship home of IMTS he did a great job and has earned a return ticket two years from now again. We brought seven machines to the show, four from out Research and development lab and three we built specifically for the show. We were excited to have sold two on the floor, and the third was sold even before the truck got home. For all our employees here that worked hard on this project, it was more than gratifying to not only have sold the machines on the floor but to have some many people inquire about our machines. There was a lot of pride in the shop when we revealed how many leads we received and when customers started calling us after the show asking for quotes. Our employees did a great job and need to be recognized for the pride that they put into their jobs and the machines that we manufacture. 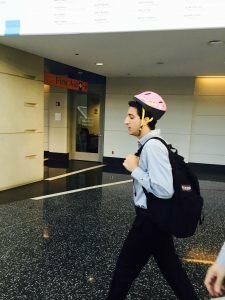 For those who remember two years ago we had two new comers to the show, they had to wear the pink bicycle helmet from the parking garage to the booth. Alex and Alan wore it proudly last time and Brandon wore it well and didn’t even flinch when it was his turn. Dan our other new addition chose the alternative, for one evening at dinner he could order nothing but Shirley Temple cocktails. He also was a great sport and happily drank his pink, flavored cocktails.